The auto show season is upon us, starting with the show in Los Angeles at the end of November. But manufacturers love to get a jump by doing big reveals beforehand. 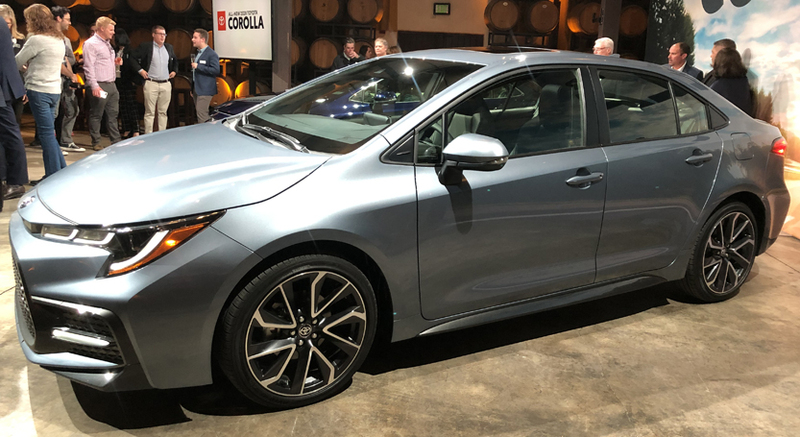 Toyota won the contest by introducing the new 2020 Toyota Corolla last week in Monterey before the press drive of the new 2019 Toyota RAV4. The Corolla is the best-selling sedan in the world, with over 46 million units globally. Hard to believe it was introduced over 50 years ago in 1966. For 2020, the Corolla sits on Toyota’s new global architecture, called TNGA. The new Corolla first appeared early this year as a hatchback, and this introduction showed us the new sedan, featuring more sophisticated styling, improved interior quality, and a host of standard safety features Toyota calls Safety Sense 2.0. The Corolla has always been the subcompact to beat, with decent size, good drivability, and, of course, reliability. It’s slightly bigger, but benefits from a contemporary design language that incorporates some of Toyota’s edginess, but keeps it simple as well. This just might be the best-looking Toyota sedan to date. While the outside looks good, the inside is where you won’t believe your eyes. You’d think you were in an entry-level Camry. Granted, we sat in a top-line model, but everything from the quality of the seat materials to the design of the dash, feel of the steering wheel and buttons, and even the trim pieces felt and looked high end. There are five grades offered for the gas-powered model (yes, there will be a hybrid offered for the Corolla for 2020): L, LE, SE, XLE and XSE. The base L gets a 7-inch multimedia touchscreen, while the rest of the lineup receives the 8-inch screen with standard Entune 3.0. 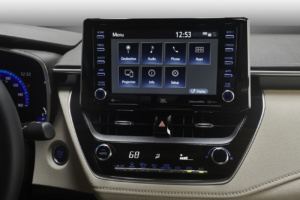 The best news is that Toyota has finally acquiesced and is featuring Apple CarPlay with Entune 3.0. We keep asking about the lack of Android Auto, but the official reply is that they are working on getting the proper security for it. Not sure exactly what that means, but just about every other manufacturer offers their audio systems with both available. 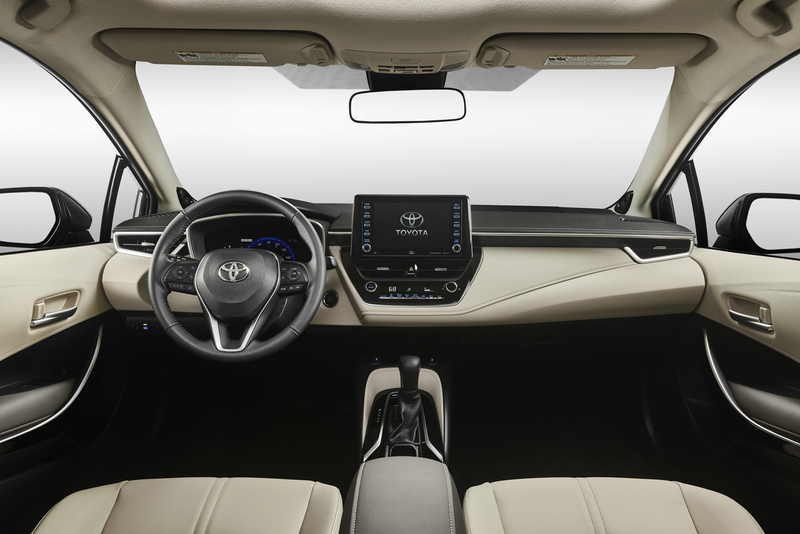 For audio, Toyota’s relationship with JBL takes it to the next level, featuring a premium option with nine speakers, 800 watts of power, and Clari-Fi (rebuilds lost compressed audio file sound) technology. 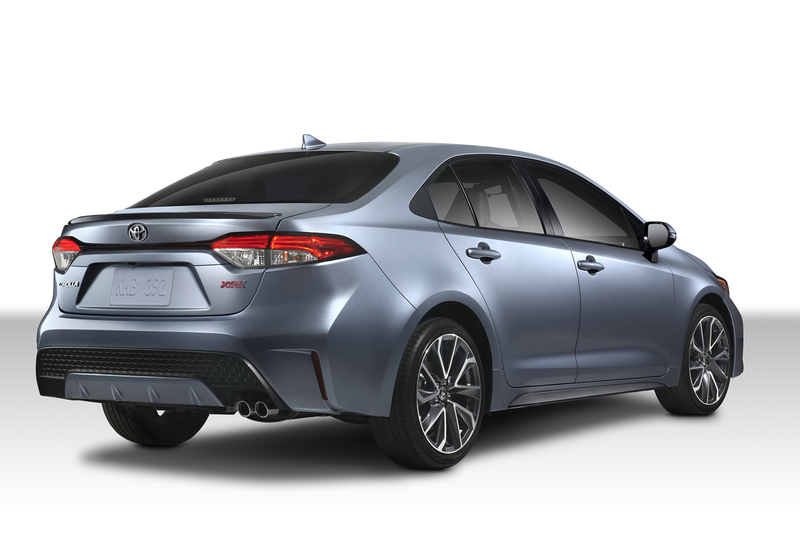 Power for the Corolla is via a 1.8-liter I4 engine, same as previously offered, but with more horsepower and improved fuel efficiency. That engine is found in the L, LE, and XLE grades. The sportier XSE and SE trims will get an all-new 2.0-Dynamic Force direct-injection I4, that also offers more power and better efficiency. Actual numbers are 169 hp and 151 lb-ft of torque. That’s close to the 1.5-liter turbocharged I4 in the Honda Civic (174 hp and 162 lb-ft of torque). Transmission choices include a CVT, but those who like more spirited movement can opt for a 6-speed manual with rev-matching. Although we haven’t had a chance to get it on the road, Toyota claims the multilink rear suspension is designed to both improve ride quality and the fun-to-drive quotient. Anything would be an improvement over the dated torsion beam design from the previous generation. One reason people might shy away from smaller cars is the notion that they aren’t as safe as SUVs and bigger vehicles. The new Corolla negates that argument with a full suite of safety features included in the Safety Sense 2.0 system. Pre-Collision warning with automatic emergency braking, Dynamic Radar Cruise Control, lane departure warning with steer assist, auto high beams, road sign assist, and lane tracing assist. For information on the hybrid version, that will have to wait for the LA Auto Show reveal. If you want to watch the reveal live, visit this site: https://livestream.com/Toyota/LA2018. Prices have yet to be announced for the new sedan, but expect it to be somewhat close to the hatchback, which starts at $20,910 with destination for the SE model, and a base of $23,910 for the XSE trim. Photo credits: Photos by Team Killeen and courtesy Toyota Motor Sales, USA.